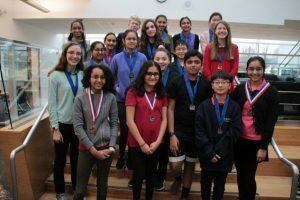 Our 7th and 8th grade science fair winners have just been announced! 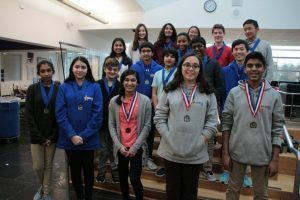 With the amount of creativity and hard work that was put into this year’s presentations, it proved extremely difficult to decide what projects would receive top honors this year. After a careful and arduous deliberations process, the Nysmith science fair judges have made their decisions. 1st Place – Kinnari: Investigated a possible inhibitor to the development of Alzheimer’s disease. Sahithi: Experimented with the effect of blade angles on the power generated by a wind turbine. Vidhi: Investigated the efficiency of an artificial pancreas. 3rd Place – Amel: Investigated the effect of pH on algae growth. 1st place – Cameron: Experimented with carnivorous plants to determine the sensitivity of the hairs. 2nd Place – Annie: Investigated the glucose of bananas as they ripen with a refractometer. Paulina: Investigated why some gene mutations cause people to respond differently to the same prescription drug. Sana: How electrochemical reactions can be used to clean silver. Madeline” Compared the water quality of flowing vs. stagnant bodies of water in our area using sophisticated water quality tests. Maya: Looked into the effect of different materials on the reverberation of sound. 2nd Place –– Justin: Investigated iron diffusion in plants. 3rd place – Kristine: How the color of roof shingles affects heat build-up in our environment. Peri: Examined water’s usefulness as a renewable energy source. Isaac: Looked at the effects of acid rain on plant growth. 3rd Place – Ella B: Researched the effectiveness of different water filtration systems to clean water. 1st place – Ella G. : Ella’s project considered different ways to make salads safe without using synthetic rinses. 2nd Place – Om: An investigation of Thermal Powered Flashlights. 3rd place – Ishnoor: Created a device to measure certain metrics of CPR in order to determine if such information could increase the effectiveness of CPR training. 1st Emma B. and Tanvi B. 3rd Sumanth M. and Shriya M.
A BIG CONGRATULATIONS TO EVERYONE AND THANKS TO OUR SCIENCE FAIR JUDGES!